A long-time pending visit to this place, had often struck a chord in my mind as a gentle reminder and now that gentle chord became a huge gong within me. It was about visiting Anand Ashram in Bevinkoppa. This had a link with my previous visit to Kanhangad, where i had met Swami Vijayananda, who i was supposed meet since long and it was a surprise to see him there. He had then invited me to his ashram to come and do sadhana. The biggest surprise to me was to know that Bade Baba's ashram was only around 50 kms from where i live and i never ever knew about this!! One day, i was craving to go to Bade Baba and wondering if it was to go to Kanhangad, when i received a call from Ganapathyji from Kanhangad for some reason and i casually told him about my wish to go to Anand Ashram and to my surprise he told me that he would be glad to join me. i could not wait and asked if he could come over the same weekend and he agreed. April 2nd Ganapathyji reached home early morning. As i was waiting for him, surprisingly, a close friend and his wife also dropped in early morning, which they never do at that hour. When i told whom i was waiting for, they were keen to meet him and they did. They told him that they would also come soon to Kanghangad and also to the ashram we were going now - Anand Ashram. 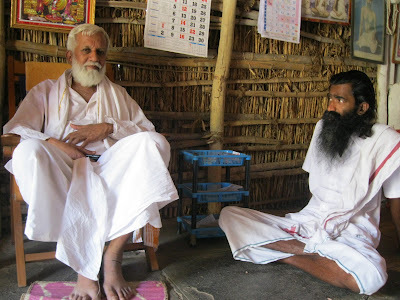 As we were having lunch, Ganapathyji changed his plans and asked if we could go to another village - Kerur near Bagalkot to meet a divine soul, and that we could then go to Anand ashram to stay for two days. He told me that it was enough if we only got a glimpse (darshan) of the divine person which was very difficult to get. Not wanting my mind to do any logic planning, i told him i would just follow whatever he thought was right. So, we took a bus to Bagalkot. After taking another bus from there and then a bumpy-jumpy full-packed auto rikshaw drive, we reached the place after 4-1/2 hours of travel. It is almost a barren village with houses of mud. We moved through the narrow lanes with stenching water with lack of the city hygiene all around and reached the house of the divine soul. The door was closed and an elderly man's voice was heard from inside. A lady came out and as soon as she saw us, knowing that we have come to meet him asked us to leave! i was taken aback. Ganapathyji said that we had come after a tiring journey and would sit outside for a while and leave and so we sat on the elevated platform of stone in front of the house. The lady kept insisting that we leave as Ajja (kannada word for grandfather; he is known in this area as this.) was not well. Ajja's voice could be heard from inside as he was asking the lady questions in Kannada and she was asking us the same. Whatever we answered, she had only one thing to say "leave.." i am sure if i was alone, i would have left, but Ganapathyji just signaled me with his hand to be seated and meditate. i closed my eyes and just sat there being "just aware". When the lady saw us with closed eyes, she started became more consistent in asking us to leave. i told her in Kannada that we would leave, we just wanted to sit for only few minutes there. She said okay but in just a minute she came out again and asked us to go as Ajja would not meet anyone as he is not well. Ajja was constantly enquiring her whether we had left or not. Then, from inside Ajja asked the lady to enquire where we had come from. 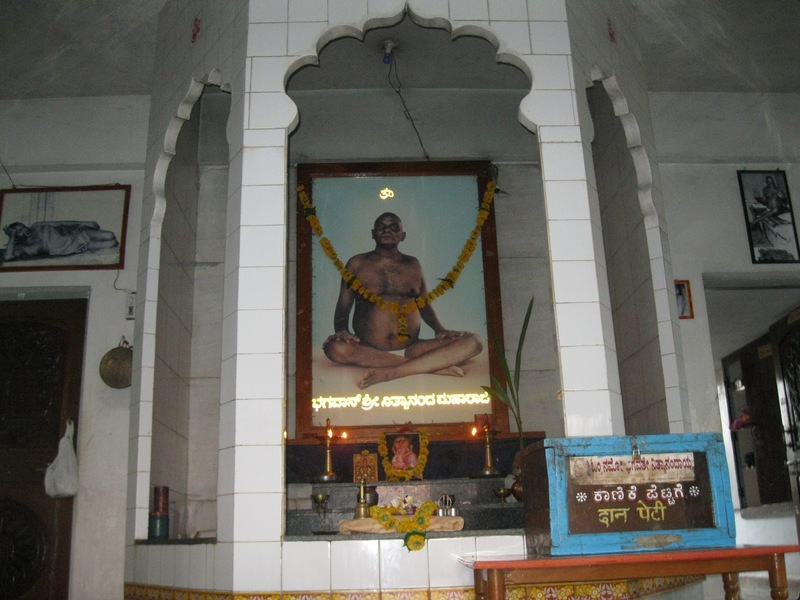 Ganapathyji said we had come from Swami Vijayanand's Anand Ashram in Bevinkoppa. She conveyed this to Ajja, who then from inside asked to ask what we wanted. Ganapathyji said we only wanted his darshan and nothing else. The lady again began telling us it is not possible. Then there was silence from Ajja for some few minutes and we also were in silence, but the lady stood looking at us worriedly as we were not moving. Finally, we heard Ajja giving permission from inside! 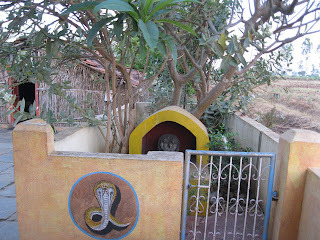 The door was opened but the lady asked us not to go in and to take darshan from outside itself. I looked in and saw Ajja , a very tall and thin man sitting with his legs folded up on the chair. Ganapathyji gave an ashtanga pranaam (prostration with the whole body flat on the ground) but i just stood there looking at Ajja in awe and when he looked at me i bowed to him with folded hands and he said "you can leave, leave.. Ajja is not well... leave, it will be late for you... leave, leave, leave" signalling his hand to leave. We then took leave of him and the lady. i was confused what was all this about. As we came on to the village road, i was wondering when on earth would a jam-packed auto or mini-bus come in this deserted place when a bus came in and we hopped in. It was 5:30 p.m. and we had five hours of travel from here to reach Anand Ashram in Bevinkoppa, and that would be possible only if got buses in time. From there, we had to change 5 buses and by the time we reached Yargatti at 8:45 p.m., there were no buses. We had two more busses to take towards our destination. Someone told us that there is sometimes an extra bus put up and if we were lucky we would get it..... we were :) That extra bus came. We had to now reach Bailhongal and from there the last bus to Bevinkoppa was at 9:30 p.m. and all we could do is hope we reach in time, but we reached late at 9:45 p.m. Now, we were thinking what to do next because Bevinkoppa was still 6 kms from here and walking 6 kms on the pitch-dark road in that wilderness was eye-bulging for me. Just then a bus came in and a person standing there told us it was the 9:30 bus itself but today it was late! Only after we got into the bus did i realize what Ajja meant by "leave, leave, leave, it will be late for you... leave, leave", and if we had missed that bus in that village after meeting Ajja , it would have been impossible to get the chain of perfectly timed buses from such a remote village and we would have been stranded somewhere or would have had to walk for miles at night. 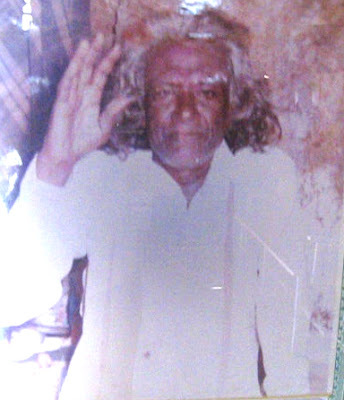 In the bus Ganapathyji told me that he was a Siddha aged 120 years! He lived in those conditions and was not freely available to public. People from all places including ministers from the State would long for his darshan. He would drive away most of them including the politicians when they came to him with worldly needs. People thought he was weird but now i knew why he did all that. He never allowed anyone to click his picture. Ganapathyji told that he would not take any offerings from anyone but instead he gave people who came to meet him, including money! This time, he was not keeping well and thus had completely closed down on meeting any visitors. Now, i knew why the lady was so keen on driving us away but some kind of joy also grew knowing that he had given his darshan. i also pondered if his being sick had anything to do with him voluntarily taking on people's misery. Siddhas are found in the least expected places and least recognized by common people. Salutations to the Nagnoor Ajja. We moved in and i was surprised to see four young children aged between 10 and 15 taking care of the entire ashram. 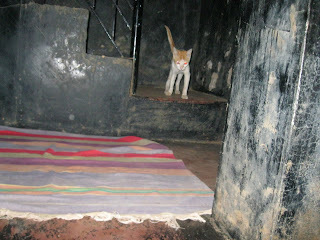 The little ones rubbed their eyes from sleep as they opened the door for us at 10:30 p.m. They served us food and put up our beds in the temple hall of Baba Nityananda. There were other rooms but they put our beds there. There was a cute little cat that was moving with us all around. 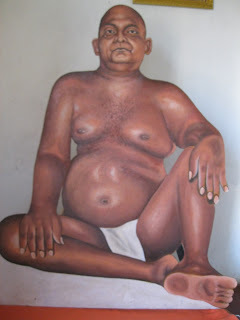 After a quick wash, we came back into the hall that had a huge painting of Baba Nityananda in the sitting posture and as i looked around found it resembled so much with the Kanhangad placements of temple bells, drums, harmonium, gong and other materials. There was guru paduka on the huge altar. i meditated sitting there for a while and looking at Bade Baba was so happy to be there. Every time one longs he is called to Him but this time He called me here, probably to experience this place. It was damn peaceful and i felt like not sleeping but to keep watching all the glittering lights and lamps around his huge photo. As i laid my my chest on my mat i fell asleep looking at Bade Baba's photo. It must have been 1 or 2 a.m. when my eyes opened and i saw something moving near the altar and it was the cat. i raised my head to see what it was upto and then what i saw was astounding. There is a donation box in front of the altar just in front of the guru paduka. The cat jumped on that box and i saw it literally folding first it's right paw and then the left paw to it's chest and seating there staring at Bade Baba's photo. i was just moved to see this. It kept staring and sat there for about 10 minutes. i thought i should click this pic and just as i wanted to get up to get the camera, it jumped off and went somewhere. 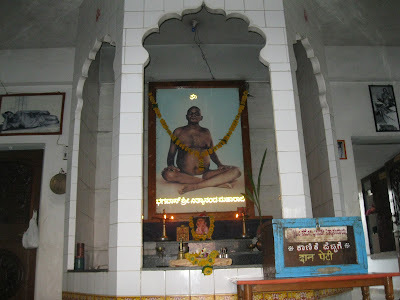 The cat in the cave at 5 a.m.
Ganapathyji woke me up at 5 a.m. and took me to a cave that was built by Swami Vijayananda. This cave was built underground and it had stairs to take one down the narrow lane. There is only one built cave here, big enough to accommodate one person. While Ganapathyji made me sit inside, he sat outside and we meditated for a while. No sooner i sat, i saw the cat in front of me. It had come here also! i had the same meditating experience as in kanhangad caves. By the time we came out there was bright sunlight and i took a glimpse of the entire surrounding for the first time in daylight. All around were farms and open land and the ashram had a rectangular space that had a large hall (temple) of Baba Nityananda, a kitchen and a bhojanalaya (dining place), rest rooms, a two-room house where Swamiji slept in one room and meditated in the other, an office space where Swamiji did his work of writing books, articles, newpaper columns and even wrote songs and plays, everything dedicated to Baba Nityananda. In the end part of the ashram were toilets and bathrooms. Ganapathyji showed me around opening every room and every space of the entire ashram. Anywhere and everywhere i looked i saw Bade Baba's images, paintings or life-size cut-outs and everywhere there was simplicity. As i was waiting to meet Swamiji who was supposed to arrive from Udupi in a few hours, i was taken to "kutir" a room made of bamboo and roof of clay tiles. We entered. The floor was of black stone tiles and on the bamboo walls hung photos of numerous saints and siddhas. i had taken snaps and videos at other locations in this ashram but did not want to capture anything inside here and inside Swamiji's resting and sadhana place without Swamiji's permission. 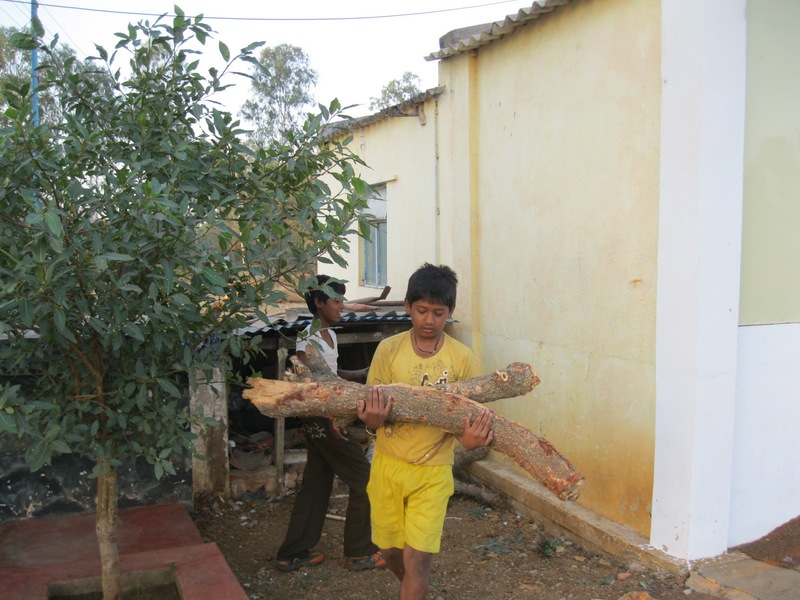 Walking around, i saw the little boys moving about taking firewood, cleaning vessels, doing aratis, playing instruments, singing, and doing everything in so much of harmony with each other. It was very touching to see them work so hard and maintain this entire ashram! Only one lady comes to cook food here, rest of the work is handled entirely by these little boys irrespective of whether Swamiji is there in the ashram or not. i was told that Swamiji took complete care of these kids and had trained them how to handle the functioning as well as handling guests and all other major functions there. i saw that none needed to be told what to do. They just knew what they all had to do even though the tasks exchanged at times! And with such harmony! i could write pages here on my experiences with these wonder boys in these three days. Even the morning 6 am and evening 6 pm regular aratis were handled by them. 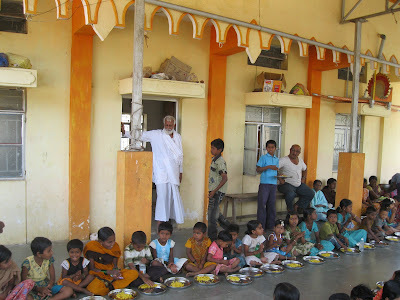 Swamiji organizes monthly Bal Bhojan (feeding children) here where around 400 children come for food. 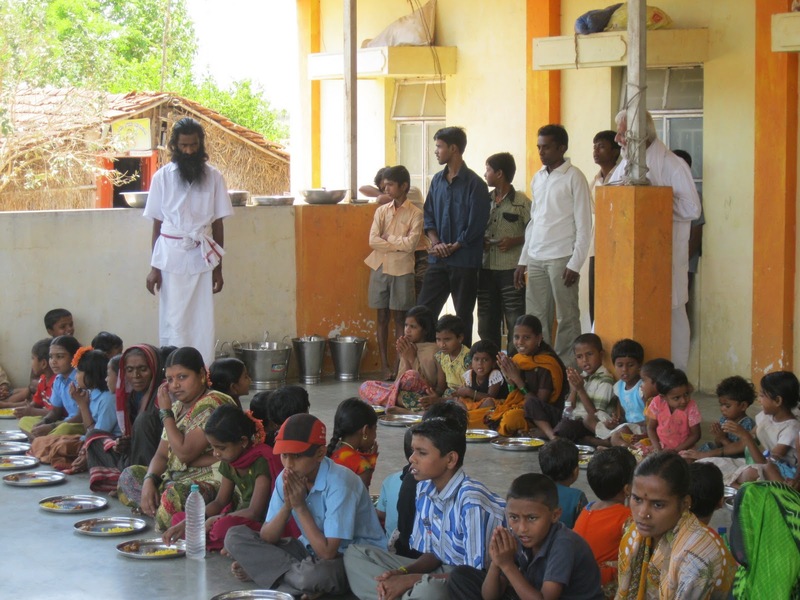 The ashram handles many children's education, marriages, medicine, free books, uniforms, etc, all done entirely from donations. The ashram has even helped building around 25 houses and now are looking forward to build toilets for the poor villagers. Also, regular maha yagnas, ganahoma poojas, ashlesha poojas, Durga namaskar pujas, etc, were conducted here for the well being of humanity. Ganapathyji then told that we would meditate in Swamiji's room and we sat there for a while. As i was ending my dhyana, i heard one of the children say that Swamiji has come. As i came out, one kid told me that Swamiji would come after bath. As we walked towards the kutir, we saw that Swamiji was sitting inside on his chair. 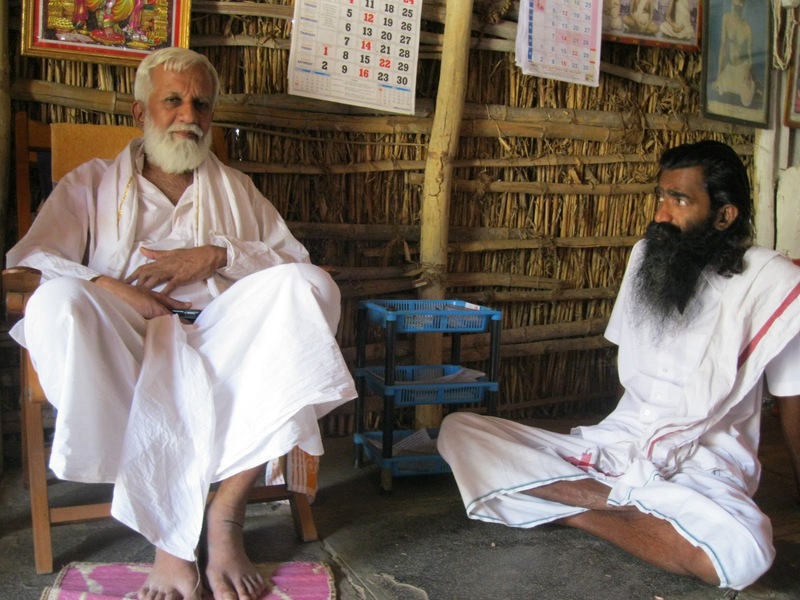 Taking his blessings, we both sat on the kutir floor and we started talking. As we spoke, villagers would come in, fall at his feet, take his blessings and leave. This never interrupted our conversations as he was least distracted by anyone falling at his feet, but he was aware of everyone who came in, for sometimes suddenly he would ask them something and sometimes give them some advices or enquire about their family members. Swamiji believes not in falling of the feet. He neither encourages it nor discourages it and continues doing what he is doing whenever the feet-falling ritual goes on, for he knows it is a compulsive ritual in the rural area. He says to fall at one's own feet since one is himself God. Swamiji then began speaking about various things. i just sat quietly listening to all what Swamiji had to say but within few minutes i was totally relaxed as he spilled out wisdom so lightly and with so much of humor and laughter. i found him laughing loudly whole-heartedly, bursting into laughter at his witty humor or sometimes when we shared something funny. In an hour of meeting him, i felt in no way uneasy and asked him if i could take some pictures in the kutir as i was waiting for his permission. He said with his eyes wide open, "Whatever you want to click you click, there is no need for any permission. The ashram is built for people and it is all yours." Now, i was totally comfortable :) and took pictures of all the saints' pictures that hung. Just then, that cat jumped onto the altar where Bade Baba small idol and photos were kept and from there it jumped on to the mud wall. Swamiji then shared some of his experiences and he never minded any questions that were asked to him and answered everything. Swamiji is humility at it's peak. All the things that i learnt about him or his powers were from people around, but not a moment could you feel that you are sitting in front of a divine person because he lived and treated all as the person living next door. 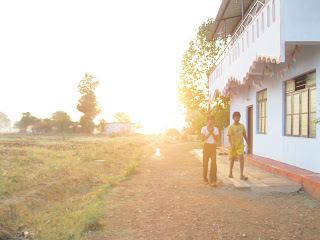 i watched as he interacted with the ashram boys. There was so much of respect he gave to everyone he spoke to. i never wanted to interrupt when he spoke because i noticed that whatever he spoke, it was all that i had to know at that moment and everything that i had in mind for a few days. In some way, he was answering to my queries. He even shared some of his mystical experiences with Bade Baba in his meditating room and the cave. Some experiences he shared at a low tone in whispers or when no one else was there around. It is quite evident in so many ways that Bade Baba is functioning through him. He then asked us to take bath and have breakfast, for he was surprised we had not had our bath and it was 11:30 a.m. i somehow had forgotten that also and when reminded did not feel embarrassed about going into the cave and meditating without a bath as i knew this is the place where least such things are given importance to. To add to it, Swamiji said that here in the ashram there were no formalities of any kind. Internal bath was more important than the external bath. He said even if you have a clean bath and sit in any sacred place, you are still carrying so much of wastes and dirt that are still in the body (organs) He laughed and asked, "Can you keep them out and go?" 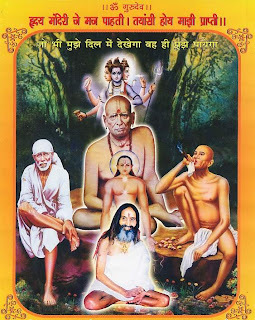 He said that here anybody and everybody could do arati, touch Bade Baba's photo/idol and anybody could sit wherever they want in meditation at any time without any restrictions. i was sure that if even a cat had such easy access to every place here without resistance, then why would humans be questioned. He then said that he would be meditating and asked us to join him in his room and i was very happy for this very noble and blessed gesture. There were many of us actually who had planned to come here but due to the sudden plans i came here only with Ganapathyji. When i told this to Swamiji he said this ashram was made mainly for that purpose but hardly anyone comes to meditate. Everyone comes for everything but meditation. So, Swamiji was very happy when he heard that there were people interested to come here for sadhana. He said anyone can come anytime adding, "Here i will never invite you nor will ask you when are you leaving, because the moment i do that, this ashram will become mine. This is His.. it is all His.. It is He who calls." In every word, action, deed and gesture of Swamiji all i saw was Nityananda. With the way he lives, it is very easy for anyone who comes to him to take him for granted because of his simplicity. 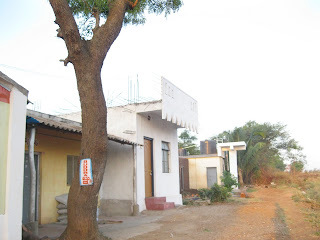 While we sat outside at times, villagers told us stories about many wonders that happened here through Swamiji by Bade Bada's grace, from wonders on how the ashram was built to healings to a homam bringing rain to the 8-year drought stricken place. When this was a mention in front of Swamiji later, he said, "True, but i have had very tough time here with people and had lot of trouble during those days. All this was not there at that time and when i asked for contribution from people for doing a maha yagna for rains, people used to tell me let it rain first and then we will give you the money." He laughed and added, "Now people are okay but initially it was very very tough and many had made things very difficult." Swamiji used to wander in this place about 20+ years ago sometimes without food and water. He used to only meditate all the time and something had pulled him to this place. It was only after things started happening for Swamiji and slowly the kutir came up and then the ashram set up, did he realize Bade Baba's plans for this place. 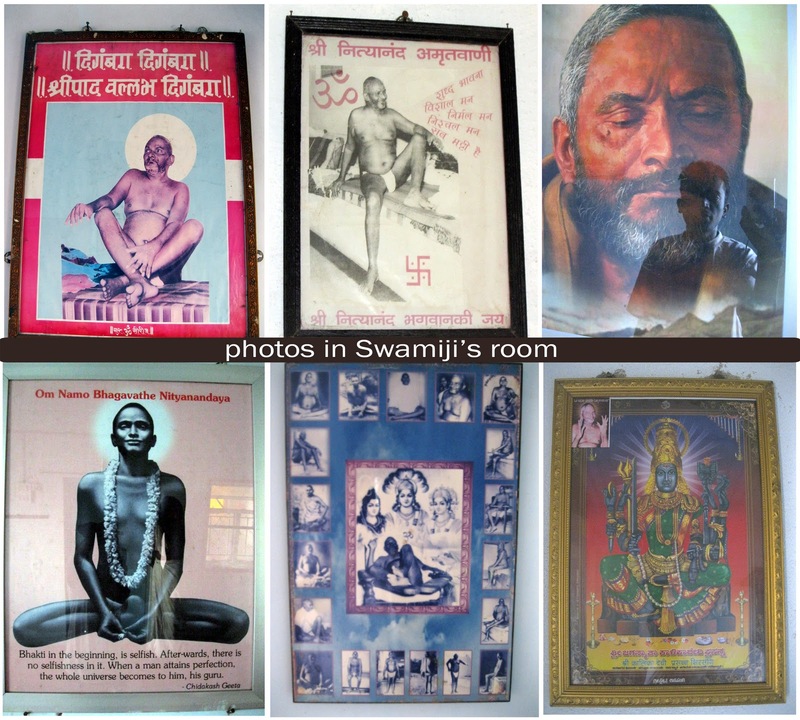 Mysteriously, without a penny, Swamiji made it all here and has been here for the past 25 years! Later i came to know that foreigners also visit here and many prominent people come here often, including the crew member of the film "Independence Day" who also has shot a short film on this ashram. He is yet to complete it. i was continuously getting surprises and jolts one by one. 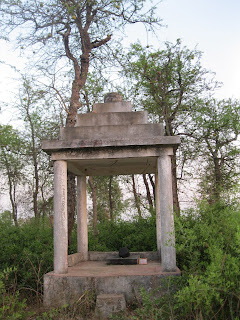 Nearby flows the Malaprabha river reservoir and it was here on its banks that Maharishi Sumedha and many other siddhas were known to have meditated and also taken samadhi. Swamiji advised me that i should go there later, which is only walkable distance. i was surprised to know these details about North Karnataka, a place where i had lived all my life and never even got a hint of these things. Coming back doing some research i found that Lord Dattratreya had walked all over the places in North Karnataka before finally been seen last in Ganagapura, North Karnataka. Swamiji also spoke about Jungli Das Maharaj and his experiences with him and again this was eye-widening because i had seen Jungli Das Maharaja's huge photo in our area's Sai temple and often wondered who he was. Swamiji told me that he lives in Kokomthan, just 8 km from Shirdi and advised that i go to him once. He also added that Jungli Dasji is the disciple of Jungli Maharaj. Some believe that he is his reincarnation. Swamiji smilingly also added that Jungli Dasji comes to meet a family frequently in the place i live in. Some teachings of Jungli Maharaj: "To attain the God the simplest and easiest way is to meditate in self i.e., Atma, God exists in the heart of everyone as Atma. Don't look at the self, but meditate in the self to attain God. Look at Sadguru in the heart and meditate. Atma neither belongs to any religion nor caste. Hindus, Muslims, Christian, Sikhs, Parsi, Jains, Buddhists all will seek God by meditating upon the self i.e., Atma the Divine Soul. Jesus Christ, Guru Nanak, Mohammad Paigambar, Lord Shri Krishna, Bhagwan Mahaveer, Gautam Buddha all had Self realization because they meditated in their self, Atma and became God." As the day passed and we spent another night in the ashram, there spilled a lot of mysteries and divine wisdom from Swamiji. Personal experiences have not been put up here, but am sharing with Bade Baba's divine wish, all that i learnt from Swamiji and what i saw and heard with .. with the only hope that it may make an insightful read and may help the reader :) in whichever way it would. More in the next post. Soon i learnt that today there was going to be Bal Bhojan and so luckily i had dropped here this day! As we talked in the Kutir, outside the young boys and other sevaks were busy cooking and preparing for the meals. Today, as the schools were closed for vacation they were not expecting a huge crowd, but as we came out of the kutir even that small expectation of children looked a huge group. Swamiji signalled to Ganapathyji something looking at me and when i curiously tried to interpret, Swamiji said, "Distribute a little sweet to the children if you can." i was more than happy to know that he was deliberately giving me an opportunity to do seva but that also with such humility. i got up and got busy into the the servings along with Ganapathyji and Murliji. It was such a beautiful time there amongst those little ones. As each came and sat, sweet was served first but none of the children touched it; i wondered why. Soon it was revealed as Swamiji came there and sang to Bade Baba and the children joined him on high volume. It was such a wonderful thing to see them sing this song of gratitude they sang. As soon as the prayer was over, everyone started with the sweets. The Gujrati businessmen who had sponsored for this day's Bal Bhojan were also present there. i had never done this before and it was real happiness to run to children who would call out either for rice, dish or pickles. Little little ones also sat there with plates that looked larger than them with little rice - as little as a bird would have and they waited for a little spoonful of dal to be poured on the rice with a twinkle in their eyes; i cannot explain how mesmerizing these little beings were :) As they finished they took their plates along and cleaned and kept it back where it was. After this Swamiji invited us to have food with him and we had food in the bhojanalaya. After lunch, we sat talking there for a while and then Swamiji left for his dhyana. We then sat out on the blocks outside the room in the company of the two dogs and often the little cat paid us frequent visits as he moved around, dashing and caressing our feet with it's tail held high as a flag post to demonstrate it's affection. Though the afternoon sun was hot, sitting in the shade with cool breeze blowing across was enjoyable. After a while Swamiji came and sat with us outside here. Swamiji had been with us all time after travelling the whole night in bus with no proper sleep for the past two days. Ganapathyji thought about this and got up and told Swamiji that he would take me to the river banks which Swamiji had asked me earlier to go. Swamiji asked to do so. i could not seen any sign of tiredness on his face, but Ganapathyji felt we should give him some time to rest. As we walked towards the place, i remembered Swamiji telling that dhyana is more powerful than sleep and even replacing dhyana with sleep is much more powerful than the sleep itself. i told Ganapathyji that i don't think Swamiji would rest and may be he is sitting still there. He was indeed still there when we came back. The place where we went had a temple that was thousands of years old and it was a temple built over a very old stone Shivalinga. The whole place looked deserted with just 2 or 3 houses or huts around and the river reservoir could be seen about 200 meters away. There was a huge neem tree in front of the temple and i remembered Swamiji asking me to sit under this tree and meditate for a while for this tree had been shelter to all those divine people who lived here thousands of years ago. 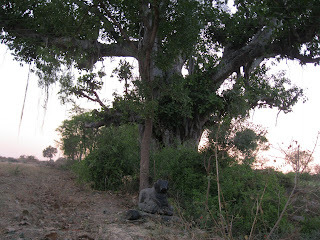 We paid a visit to the Shivalinga temple and sat under this tree. After some time, while the other two were still meditating i got up and walked around this temple and saw many natural Shivalingas that had very ancient look on it but had signs of fresh worship. As i walked down the muddy road i spotted another samadhi of a Jain monk. Going further down there were many ancient stones and broken stone idols, which could be connected back to many centuries back. This area was full of Bilwa patra trees. 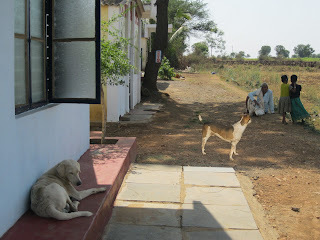 When i returned to the place, they both had got up from meditation and we walked back to the ashram. This place is just 10 minutes walk from the ashram. Upon return Swamiji told me that the place i had walked down to was also the property of the ashram and he plans to build pyramids there for meditators. i just visualized the scene.... water flowing, on the banks of it pyramids, surrounded by Bilwa patra trees and so many Shivalingas, the huge neem tree and the ancient temple, and no pollution, no crowd, no noise around..... wow! 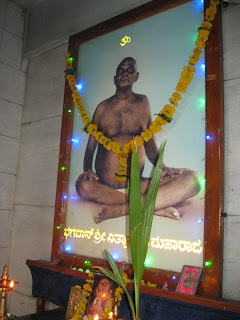 Swamiji gave us his office room which had a bed to sleep, but we three preferred to sleep in the Nityananda Temple itself. So after dinner, we came to this place and spread out the mat and after meditation, retired to sleep. The little boys were all fast asleep and i could see how weary they were after the whole day's activity that ended with cricket that they played in the evening in the ashram ground. Simple, adorable lives the children lived here. Contentment and peace showed on their faces as they were in deep slumber. Swamiji spoke to them always with ease and love and nothing looked like an order there, but even then the boys took his every instruction as an order from the Guru. The tea that one of the ashram boy, Nityananda, makes here is delightful. He was named Nityananda after a childless couple came here and were soon blessed with this boy. They sent him here later. Next morning, we woke up at 5 a.m. had our bath and spent time again with Swamiji. 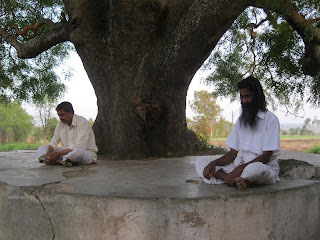 Then, as his advised, we went to his meditation room and sat with him for meditation. After that, we had our breakfast and spent our time with him. The whole morning and afternoon was spent with him and some time moving around the ashram. We were supposed to leave after lunch and so we tried to spend maximum time with him. After lunch we sat outside. People continued to come to him for several advices and solutions and he talked to them all, many of who had left their habit of chewing tobacco and alcohol addiction. One person was chewing paan and Swamiji asked him why he eats paan. The man replied that it gave him pleasure. Swamiji asked why does he add chunam (quicklime) to the paan. The man replied it was to produce the color that makes the mouth red. Swamiji asked why does one have to make the lips red to have pleasure. The man had no answer but after thinking for a while he said the chunam gave taste to the paan. Without missing a breath Swamiji asked, "Then why don't you put chunam in food and have if it adds taste?" The man though was smiling became thoughtful. After a little conversation, the man promised that he would leave chewing tobacco from then itself. In the morning when Swamiji was talking to us about maili vidya (tantrik sadhana for achieving external siddhis) and mentioned about how it is misused. He said these siddhis acquired with such entities finally engulf the person itself. When i asked him are not people aware of the consequences when trying to achieve such powers, Swamiji said, "Who is bothered? What they can do now is all that mattes to them - they prefer to deal with the consequences at that time only or at death." He compared this example with addiction, continuing, "When people chew tobacco, they know that the habit can cause cancer, but who is bothered? They prefer to tackle it when it comes. Right now, they want to enjoy the pleasure even if it is at the price of disease and death. Same way is it with external siddhis." Swamiji then told us some stories from mythology and related them to various present day experiences of life. But whatever he said, there had to be a story about Bade Baba and i could see how he related and credited everything to Bade Baba with total selflessness. Swamiji then mentioned about Sogal Ajja (kannada word for grandfather), a siddha who lived in Sogal and thus came the mention of Sogal Ashram. He was happy when i surprisingly mentioned to him that i have been visiting Mohan Swamy in that ashram for long. (click here to read about experiences with Mohan Swami) i was only getting surprises of how wonderfully connected is everything! There in Sogal, the siddha (Sogal Ajja) would all the time be heavily drinking alcohol, but was never drunk. He ate meat. He did everything opposite that the world thought was bad. He uttered foul words. He called alcohol nectar and called meat prasad. Swamiji honestly said that at that time (when he used to visit him in his cave) he was confused how can he be a Siddha but then later got to know how powerful he was. All that he said the opposite of it would come true! He spoke a bad word but whatever he spoke was actually a blessing. He threw sugar at someone and the person later got established in sugar business. He always said things that the world considered offensive or bad. i heard the story of a similar Siddha, who once a brahmin came across. The brahmin was against meat and liquor and he criticized the Siddha for drinking alcohol and found that when he reached home he himself was totally drunk with foul liquor odor from his mouth, though he had never drunk a drop. He had never touched alcohol in his life. He rushed back to the Siddha and fell at his feet. Then the Siddha told him, "Do you know why i drink? i am taking on the habit away from many, many of the younger generation who are affected with this addiction." Swamiji continued saying how unconditional and selfless such Siddhas were who did such acts for the benefit of humanity and how they were easily misunderstood. The siddha also did everything opposite to illustrate that everything is one, there is no good or bad. Swamiji had got touch deeksha from this Siddha, who had got direct deeksha from Avdhoot Siddarameshwara, who was given the touch deeksha by Baba Nityananda :) "Wow" i said to the unveiling mysteries. This Sogal ashram also has three other jeeva samadhis of Siddhas including a woman who meditated on this rocky hill. This place (Sogal) is only 30 kms from here :) Another place which i always knew about but not it's significance is Saundatti, about 40 kms from here. i knew that this place had a great mythological significance to Goddess Renuka, but only knew from Swamiji that Renukaji was Lord Parshuram's mother and her father's guru was Saint Agasthya Mahamuni. Swamiji then gave a few more leads and hints of more such people spread around North Karnataka, Andhra Pradesh, Maharashtra and Gujarat. Our plan was to stay for only 2 days and hence we took Swamiji's blessings, who asked to come and meditate here anytime we wished irrespective of he being there or not. We left back home as per our plan. In the bus, Ganapathyji told me that it was first time he saw Swamiji talk so much continuously for two days. i knew it was nothing but Swamiji's understanding to give as much as possible to seekers who craved for it. 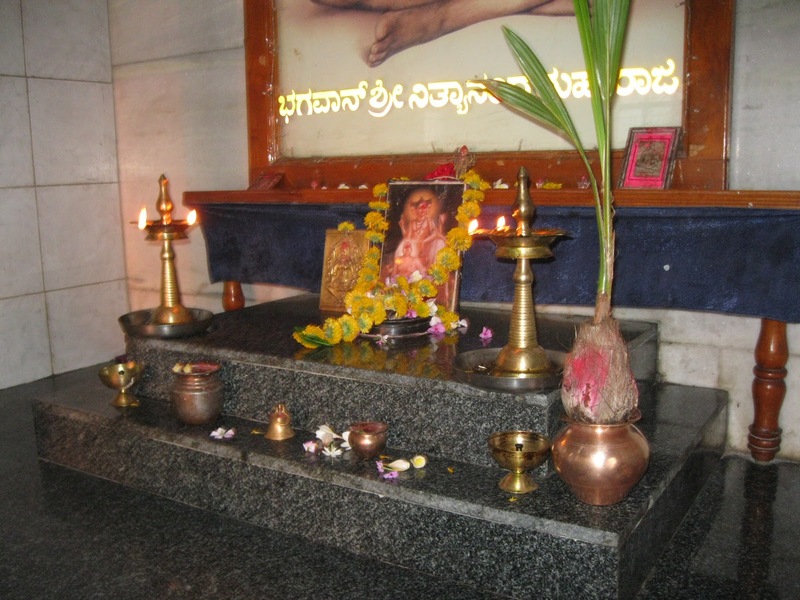 It was here that i realized that Ganapathyji was the disciple of Swamiji and it was Swamiji who had deputed him to be in Padiyar Swami's house in Kanhangad. While coming back home me and Ganapathyji met the same friend who had come home with his wife early morning before we had left home for this trip. He was keen to go to the ashram and asked if we could go there the next day as his shop was closed on Tuesday. i told that i would check if i could finish my work and see the possibility. i dropped Ganapathyji to the bus stand from where he proceeded towards Kanhangad. Surprisingly, the next day i was able to finish my work by 10.30 a.m. and my friend and his wife came home and we left again to the ashram, this time my only purpose was to take them there as they had the longing. Moreover, this time on my friend's request, my mother also joined us :) i informed the ashram of our coming and we four left in his car. This way, i was able to spend another full day there with Swamiji. This time they spoke to Swamiji regarding something they wanted to talk and in the meanwhile i was able to meditate in the cave and also spend some good time around. After lunch Swamiji spent a great deal of time with us and also enthusiastically showed us his harmonium which was tuned to accordion and sang a song for us. He then took us around and showed some herbal plants and trees and their valuable properties in healing. i understood that my friend and his wife dropping in home out of the blue when Ganapathyji came home that early morning was not a co-incidence. They told me that Swamiji in his talks was somehow giving them solutions for what they had come there for. They wished to take part in the the Mruthunjaya Havan and Durga Namaskar Puja to be held on April 17 for the benefit of everyone. Dhyana is important everything and it is only dhyana that will redeem one. He said if one does one hour of sadhana it is important to see what one does in the rest of the 23 hours. The mind makes one do many things that can distract one from the path. For this, he emphasized on internal chanting of the guru mantra at all other times. He asks to follow whichever Guru you are following with full faith. Whatever you concentrate on, you become that. If you meditate on Shiva, you become that, if you meditate on Nityananda you become that, if you meditate on fire you become that. All vasanas should be cleared with dhyana. Whatever your vasana at death you will come back in that. He reminded about the cat and said, for example, if one has very close attachment to cat, one may come back as a cat also, irrespective of what the spiritual growth is, just because of that strong vasana. i asked him what should be on the mind at the time of death then? He said, "Nothing!" You call "Shiva Shiva" during death and you may be born in a Shiva temple, he laughed. One should transcend all gunas. He said there are four gunas - Tamo guna, rajo guna, sato guna and shudh sato guna.. Because even sato guna even though pure still has a quality. Like the knowing or awareness at higher consciousness of "I am pure" is also yet a quality and the nothingness has still not come. When one transcends even above the sato guna one attains the shudh sato guna (which we refer to as nirguna) a state of no quality, nothingness. He told the story of the yogi who burnt the bird with a mere look and then tried to do the same on the lady who was serving her husband food and did not come out quickly when the yogi called out for alms. The woman told him that she is not the bird that could be burnt with a look and the yogi was shocked how she knew about it. When he pleaded to make him her disciple she asked him to go to the butcher. He was shocked on making a butcher his guru, but went to him the butcher spoke nothing but made him wait as he cut meat, bargained and sold it. The butcher then told the yogi that he knew the lady had sent him but he had to wait as the butcher had to go home and attend to his sick parents. He did so and came back and the yogi fell at his feet to accept him as his disciple. Swamiji then said, "See, the butcher, was a great yogi in his previous life and had achieved all powers but he criticized again and again people who ate meat and that became his vasana and this life he was born as a butcher. So never CRITICIZE anyone." One man was said to have sarpa dosha because he had killed a snake and when he went to the priest, the priest told him that to remove the dosha, certain rituals and practices would be needed that would amount to 4 lac rupees. His domestic conditions were very bad and even if he sold his house he would not get Rs.20,000. He came to Swamiji and told everything and told it was because of his dosha. Swamiji said, "You don't have sarpa dosha, but you have priest dosha..." We roared in laughter. Swamiji told that he then asked that person to go to a temple and deeply apologize for his wrongdoing and make a simple offering to God with his bhaava and everything shall be okay. Baba Nityananda has said that wherever there is bal-bhojan (feeding children), He will be there. Today, man has dominated even God. When Ganesha is taken people give him security. Tell me who is greater now? The one who is supposed to protect us is being given protection, he laughed. Similarly, man today decides which God who can meet and who cannot meet. Who is greater? The God who is willing to be one with everyone or the man who decides this? The ashram is conducting a Mruthunjaya Homam and Durga Namaskar Pooja on April 17, 2011. 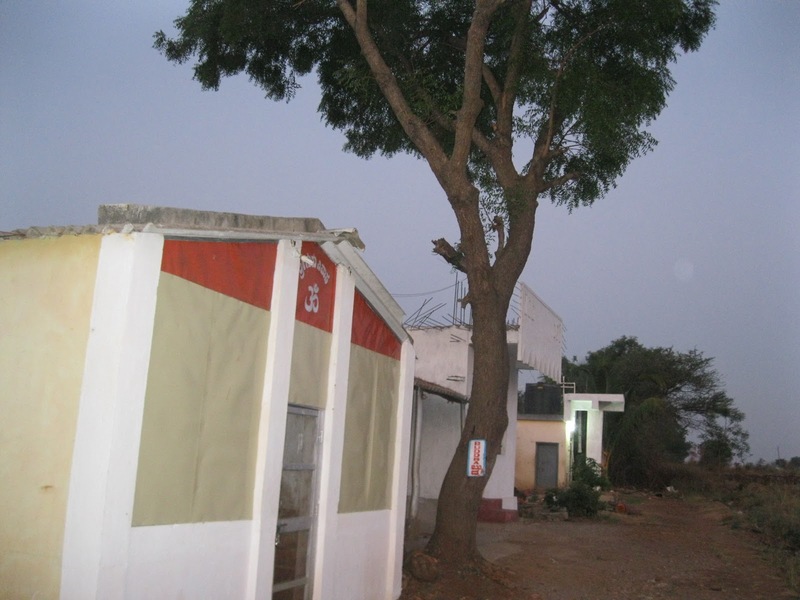 If you are interested to visit the ashram, you may do so any time. All activities of ashram run solely on contributions and donations. All complete details about Swamiji and every detail of the ashram is available on the ashram website. Swamiji says all are welcome to spend any number of days here in sadhana. i now understand why in my first meeting with him in Kanhangad he had told me after inviting me to the ashram, that there will be lot of activities but not to come for that but come to do sadhana. I must say this is an ideal place to do sadhana and definitely a cherishing experience to meet Swamiji. Gratitude to Bade Baba, Swamiji and all holy Siddhas. After two days of posting this article, i got a message from Swamiji's relative living in the US, who shared another video that he had made for Swamiji. Posting it here.